At Rightstyle Kitchens we have a wide range of styles and colours to choose from plus all the latest innovations in storage, lighting and design. 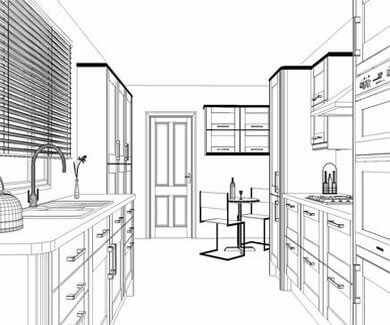 Using our computer aided design software we can plan your perfect new kitchen whether its a contemporary or traditional design. Rightstyle Kitchens have been in business for over 30 years and have a wealth of experience in the kitchen design business. We aim to supply and fit a quality kitchen, designed to your exact requirements and at a price within your budget. We are so confident in our craftsmanship that we offer a no quibble guarantee. We are a family run business that does not employ sales people. You will always deal directly with the owner Graham Hunt. Arrange a home visit now which will take no more than an hour and we will bring your ideas to life at an affordable price and without any pressure.